Look at some books to earn some loot. 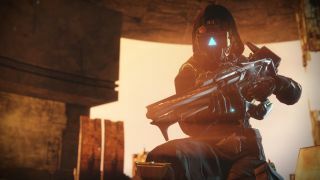 Here's our quick video guide to opening the secret chest on Mercury in Destiny 2: Curse of Osiris. Did you spot the secret chest behind a force field in the Lighthouse area? Destiny 2's Curse of Osiris expansion features a few little surprises like this. To bring down the force field and reveal the chest you have to do a bit of running around to solve the puzzle, examining books and decrypting a conflux to expose the chest. It only takes a few minutes, and you'll get some goodies for completing it—enjoy.